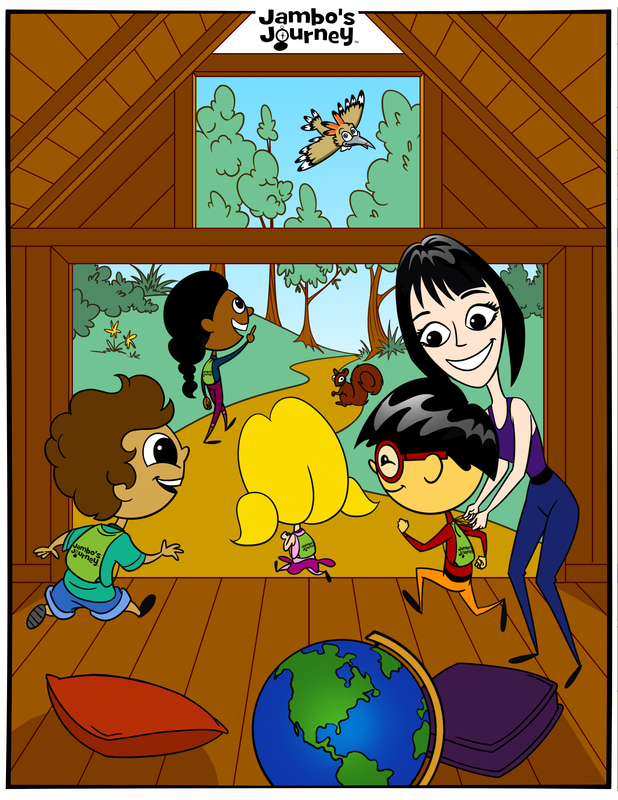 Jambo’s Journey™ activities are designed by Ms. Jen for all types of children, at various child development stages. Ms. Jen and her ALTER EGO, Jambo, are your TOUR GUIDES through the world of arts and crafts. Ms. Jen will encourage your child to discover and celebrate their own unique gifts and make their daily routine seem like a fun ” voyage .” Jambo teaches children to SHINE bright in the WORLD around them! Ms. Jen is a classically trained actress and founder of three performing arts schools. Her program is based on her own experience with her students. Considered a seasoned director,coach and mentor in the performing arts, she has been fortunate enough to partner with top academies,preparatory schools and early learning centers in the Greater Atlanta area for fifteen years. Jambo’s Journey™ is designed to spark and encourage children to learn through play. F or more than a decade, Ms. Jen has watched hundreds of her students overcome social barriers by teaching them to express themselves while they imagine they are another “character.” This ” role playing ” not only stimulates imagination, it frees the child to become other characters, if only in their imagination. Your child’s endangered species puppet serves as their ALTER EGO or “character.” Jambo’s Journey™ will help your child connect to their imagination through their Animal Alter Ego. Follow the PUPPET ACTIVITY guide on the PLAY page and create your child’s animal puppet . I am amazed at how effective communicating through a puppet is. Puppets throughout history have entertained children and adults. The Muppets™ are loved by a wide range of age groups. I have experienced this phenomenon as a parent and director. As a parent, the quest to find happy, healthy, moral, and relatable ALTER EGOs can be a challenge. Kids need positive role models in our technologically emersed and technology driven world. Team Jambo offers role models that instill a FUN and meaningful purpose in kids to CELEBRATE EARTH DAY everyday! This is a much needed solution to the sometimes shallow, derogatory, and violent “characters” and “alter egos” our children have to choose from. As a director in theatre I use Broadway characters to help children who are shy, awkward, and lack self esteem transform into confident, radiant and charismatic performers. I have countless TESTIMONIALS from parents acknowledging that the lessons their children learn through these “characters” on stage have carried over into their day to day life. This performance experience builds character traits and self esteem that have helped their child find the confidence they needed to SHINE. This will be the goal with your child’s endangered animal puppet! Start your day and join TEAM JAMBO™! This TEAM of endangered species will transform daily routines, or challenging tasks into rewarding adventures. Together this mighty TEAM with your child’s puppet will promote social skills, nutrition, grooming , recycling games , and outdoor adventures. Ms. Jen will serve as your TOUR GUIDE , while TEAM JAMBO™ will inspire your child through their ALTER EGO. Hundreds of her students overcome social barriers as they express themselves and imagine they are another “character.” Your child’s endangered species puppet will help them have a voice when they find it hard to speak as themselves. This is the beginning and through line of Jambo’s Journey™. Communicating through a puppet as a means to connect with children is well received and used in many pathways to reach kids. You can make positive suggestions to your child through your own animal puppet. Puppets can teach lesson’s and children may receive this knowledge much more readily from a puppet.Have you ever given wonderful advise to your children repetitively only to find that they would finally listen to a third party? The puppet character you and your child create will give your child a sense of imagination and a friend who can share in their daily adventures. Their puppet can be there at all times. Their Endangered Animal Friend can help make friends if they feel shy or awkward on their own. They can tap into a world of imagination with their puppets. Imagination is an essential and key ingredient to the healthy development of a child as they GO through life. You can research this theory on your own, but experiencing the joy of connecting with your child through play is indescribable! In our ever-changing world, our ever-changing schedule can disrupt our plans or regular routine without notice. In theatre, plays follow a script and cue sheet and stage directions. This gives structure to a free and creative process. In my classes help each student 1) identify their role or character 2) script or map out a plan 3) engage in the creative process and perform, and 4) finish with a reward. I encourage parents to follow these 4 steps each day. Starting with an agenda or script will give each day structure for life’s many journeys. This also helps you get back on track when the inevitable and unexpected happens. 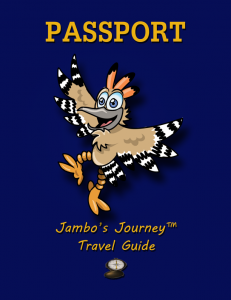 You can print the Jambo’s Journey™ PASSPORT page and attach it to a notebook. This PASSPORT journal is for your child to use and can serve as a travel guide throughout the day. This journal entry can be the script for the end of the day as a recap and presentation of the days many adventures and good deeds. Print the JOURNEY JOURNAL page to use as a guide or make your own. I have found that this allowed me to incorporate the multiple ideas of my many students, and would help me budget my time in a more efficient manner. It also prevented the tendency to over commit, and eliminated the constant feeling that I hadn’t made progress that day. I could always refer back to my JOURNEY JOURNAL, and rearrange my “travel plans” or “road map” for the next day to reach the ultimate goal, to help my children SHINE. The ROADMAP and SCRIPT encourage productive and healthy choices, if done routinely these actions become HABIT and eventually second nature. Try to keep a consistent ROUTINE in place and SCRIPT tasks, adventures, and creativity through out the day. FINALE~ reward~ (applause, a compliment, a sticker, or utilize Jambo’s TEAM TALLY point system ) ~ visit the Snack Time recipes on the Play page for global treats ~ Sweet Dreams! You deserve a good nights rest, tomorrow is a new JOURNEY! The final step each day is the PERFORMANCE. Through out your day make sure to use your Journey Journal. This journal is the script for the show day RECAP of the journey. In the show, share good deeds, present art work, you can even perform the Jambo’s Journey Theme song or make up a song , or sing and dance to your favorite tune. Watch your child light up when they hear APPLAUSE, and receive compliments from the family. REWARDS in any form will help encourage children and reinforce good, and kind daily patterns for living. Who doesn’t like rewards? No matter what reward system you find effective for your child, using positive reinforcement will increase your child’s self esteem and self worth. REWARDS are not bribes, they are incentives and affirmation, and help children achieve goals. Children are not alone in their excitement in achieving goals and rewards, adults and humans in general are wired to respond positively when there is a bonus after doing good. What human doesn’t work harder or motivate themselves to perform daily tasks more efficiently knowing a reward or treat is waiting at the finish line! JAMBO”S JOURNEY is designed to help make the journey with your child fun, creative, expressive, and meaningful!!! 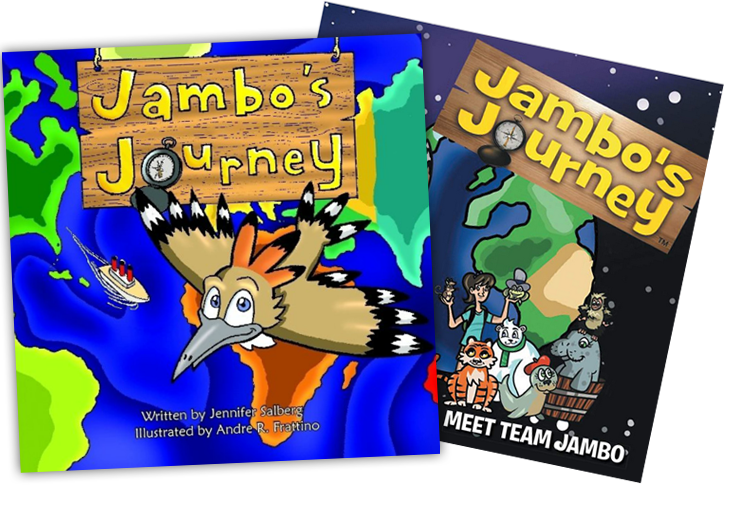 While Jambo’s Journey™ is a roadmap for every child, it is specifically designed for the Atypical child. Ms. Jen has mentored autistic children for the last five years and knows first hand that connecting the Atypical child to the world can be overwhelming. The COMPASS ICON will point caregivers to various alternate routes for children learning to overcome the challenges associated with ASD (autism spectrum disorder), ADD, and ADHD. Ms. Jen together with TEAM JAMBO have seen children transform and find their voice, connect to other children, and learn to SHINE in the world around them. Click the Compass Icon for an alternative route for the Atypical child. These suggestions are designed to connect children with Sensory Processing Disorder (SPD) to TEAM JAMBO's activities.